Dynamical system theory has developed rapidly over the past fifty years. It is a subject upon which the theory of limit cycles has a significant impact for both theoretical advances and practical solutions to problems. 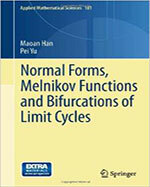 This book introduces the most recent developments in this field and provides advances in fundamental theory of limit cycles. Split into two parts, the first focuses on the study of limit cycles bifurcating from Hopf singularity using normal form theory with later application to Hilbert’s 16th problem, while the second considers near Hamiltonian systems using Melnikov function as the main mathematical tool. Classic topics with new results are presented and are accompanied by the liberal use of illustrations throughout. Containing many examples and structured algorithms that are treated in detail, a good balance between theoretical and applied topics is demonstrated. By including complete Maple programs within the text, this book also enables the reader to reconstruct the majority of formulas provided, facilitating the use of concrete models for study. This book will be of use to graduate mathematics students wishing to study the theory of limit cycles as well as scientists with an interest in the applications of periodic behavior.